A nor'easter is basically missing the area today with a few showers and storms this afternoon from another system. Sunshine is the dominant weather feature this weekend. If you’re feeling disappointed about today’s gray conditions after yesterday’s sunshine, take some solace in knowing that we’re dodging a nasty storm that’s churning past us in the Gulf of Maine. Looking at the latest water vapor loop below, you’ll see something very similar to a winter type situation when a snowstorm is about to pass by and just misses walloping Maine. This storm is clipping eastern areas as it passes by this morning. There are showers from about the mid-coast eastward. If you watch this loop a few times you can see the general movement of the storm eastward even as it’s moving north. This is why this is basically a miss, not a hit, and why there could be breaks of sunshine over western areas. Notice the rainfall is not penetrating inland this morning. To make matters a bit more complicated, there’s another weather system which will move in from the west Friday afternoon. This system brings with it its own showers. The bottom line: today isn’t perfect, with cloudiness and a chance of showers, but most of the time it will be dry, and some breaks of sunshine are possible. The timing for afternoon showers and embedded thunderstorms is roughly 1 p.m to 8 p.m.
Tonight skies clear and that sets the stage for the warm-up you’ve likely been hearing about. This is a bona-fide summer pattern and temperatures will be extreme for June. As cool as it was to start the month, it’s about to get unusually warm at least for a day or two. Let’s talk about the warmth coming behind this weather system and the humidity. Saturday still won’t be very hot or humid. There is a risk of a pop-up shower or t-storm in the afternoon, but those will miss most areas, so don’t cancel any plans because they are in the forecast. Temperatures reach the 75-80 degree range and dew points, a measure of humidity, won’t be very high. That all changes during Sunday and Monday. There will be several towns, possibly including Portland, reaching 90 on Sunday. The same scenario is likely in place again on Monday. Humidity levels are going to skyrocket. Some models have the dew points well into the upper 60s. That makes for an oppressive level of humidity, and we are not used to this yet. Reaching 90 is much easier inland than at the coast. Any slight wind direction which carries just a bit of marine air into places like Ogunquit, Wells, Portland, Brunswick and other coastal towns would prevent a 90 degree day. Tuesday we will watch a cold front beginning to show up in eastern Canada and slide south. The actual front will stay north during the day, but I see enough cooler air intruding to prevent a third day of near 90 degree heat. It will still be humid before the dry air arrives at night. By Wednesday it will be much cooler and drier. 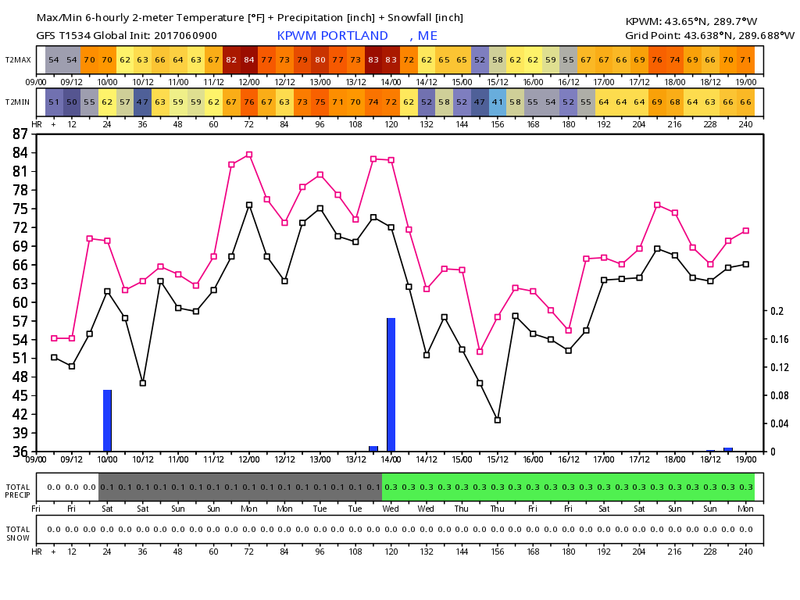 The GFS model has Portland reaching into the 80s Sunday, Monday and Tuesday. Cooler, more seasonable air will arrive on Wednesday and Thursday with humidity levels in check and temperatures back into the 70s.